There’s a fixed mindset in many corners of the country, perhaps especially in the Midwest, which holds that highway building is an unquestioned economic good. That definitely seems to be the strategy elected leaders are pursuing in Indiana, Renn says. After three decades of political pressure from southwest Indiana, the state has begun constructing I-69 between Evansville and Indianapolis, a project that will likely cost at least a billion or two dollars to complete. And already, highway boosters are starting to agitate for their next big project: I-67. One might perhaps justify I-69 on the simple matter of fairness. Look at a map and see freeway spokes radiating from Indianapolis to the rest of the state, with the southwest link missing. But it certainly wasn’t justified economically. The existing interstate rolling through Southern Indiana, I-64, is the least traveled in the state despite linking St. Louis and Louisville, and has not spawned much in the way of economic development. There’s little prospect for I-69 doing much better, at least south of Bloomington. If you wanted to build it to try to save the Crane Naval Warfare Center from closure then fine, but at least say that’s why you’re building it. What this actually shows is that for a lot of people, building highways is a end itself. There will never be a day when people aren’t pushing some sort of massive boondoggle. It may well be that the state hasn’t agreed to build this road. But it’s also early. Few of Indiana’s major projects, whether that be the Illiana Expressway, I-69, or the Ohio River Bridges, were cooked up by the engineers in INDOT’s planning department. Instead, they were local priorities that over time became “high priority” projects for the state. 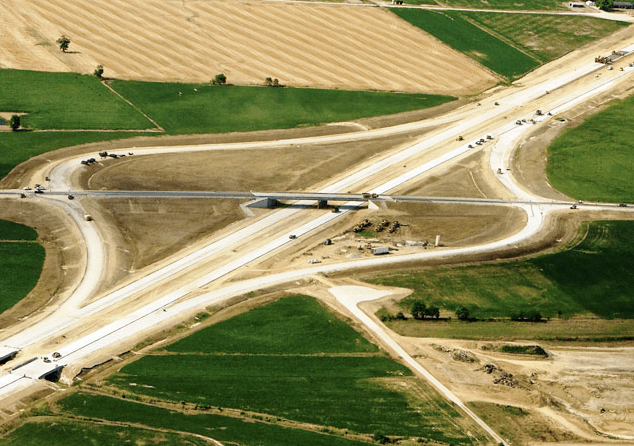 Without much else to offer economic hope to fading rural areas, small towns, and old small industrial cities, highway construction is easy snake oil solution. No amount of highway construction will ever satiate this never-ending demand for yet more mega-roads. Elsewhere on the Network today: Greater Greater Washington reports that DC may start offering reimbursement to District employees who commute by bike. Mobilizing the Region writes that New York state just slashed funding for biking and walking, soon after enacting a complete streets law. And Systemic Failure remarks on a court case that could have implications for rails-to-trails projects nationwide. Per the advocates’ own website, their well-respected consultant estimated that the dreamed-up freeway would only carry 16,000 vehicles a day!?! That’s well within the same volume that many DOT’s are now comfortable to road-diet on a 4-lane urban thoroughfare down to a 3-lane complete street. I frequently drive between Chicago and a Kentucky city in the Evansville area. I hate passing through Terra Haute on US 41, and I-65 between Indianapolis and Louisville is a nightmare not worth considering. A new Interstate link between Indy and Evansville will benefit me personally a tremendous amount … and I am likely one of the only people who passes through Indiana who can say that. They’ve been talking about this highway as long as I can remember, and my Kentucky hometown even funded a new Ohio River bridge a decade ago to connect to it, but I always thought it was an absurd idea. It will save me probably about a half hour, and I suspect the number of people on the highway with me will be in the low double digits. It’s idiotic. So much for Indiana, a nice red state, working to reduce the size and cost of government. Pork always wins over ideology. Interesting that a mega project may be creeping along incrementally while at the same time major federal-aid highway projects are required by statute to feature logical project terminii and demonstrate independent utility. The problem with I-69 is that it merely duplicates interstate routes that already exist, saving virtually no time or distance. This new section through Indiana, for instance, will connect to a weird dogleg in Kentucky that is no more a direct line than the current interstate route that follows I-70 and I-57 to I-55. The only section of 69 that involves completely new interstate is the portion from Texarkana south. Similarly, what need is there for a new interstate from Indianapolis to Grand Rapids, when you can easily cover that route via I-65 to I-94? A straight-line route through South Bend saves 38 miles, or about a half an hour, for all that huge volume of Indy traffic headed to Grand Rapids. It’s not worth it. Both are not comparable. You don’t want speedy traffic on a city street, but you also don’t want 30mph traffic on rural areas where distances traveled are long, and speed becomes important. Moreover, vehicular counts can be particularly deceiving if a route has a lot of truck traffic. Many routes in the Midwest are close to Interestate standards. What they usually lack are total grade separation with farm roads and control of access to sparsely located farms, which is relatively cheap to correct. Just take a map and notice how many 4-lane divided roads are out there, with generous curve radii and, by virtue of terrain, flat. In those circumstances, upgrading the routes and commissioning them as interestate is not that expensive, it involves (like the current US-20 in Iowa or the new I-69 in Texas) building cheap over/underpass for farm roads and building some access roads for farms that are cut-off from direct access. Piece of cake in terms of engineering. Right-wingers NEVER reduce the size or cost of government. Right-wingers LOVE them some HUGE, BLOATED government pork. What right-wingers want is for the pork to go to their buddies, and not to liberals / black people / women / poor people / peace activists / whatever. Pure tribalism, no principle. Reagan’s administration, with its doubling of expenditures on wasteful military contractors, proved this to me. Then perhaps they should build a 3-lane complete street on this “I-67” route. Actually, that would probably be a hit — best walking and biking route in the whole state of Indiana — old-fashioned slow country driving like on 5-and-20 in NY — popular. I wish Fort Wayne had some highways! Second largest city in Indiana,served by a single interstate highway. No freeways within the loop of I-69 and I-469 which was laid out by idiots (I-469 is mostly too far away to be used by anybody except trucks heading from Indianapolis to Toledo via US 24), US 30 between Fort Wayne and the Chicago region is a joke…. I guess South Bend doesn’t exist? US 31 was a joke before the long-awaited upgrades it is now receiving. It would be vaguely interesting to know your point, but only briefly. Of course South Bend exists, at least for a few Saturday afternoons in the Fall. However, South Bend already sits on an interstate highway providing a direct route from Chicago or Cleveland, and a virtually direct route from Indianapolis. I’ve been on 31 south from Grand Rapids … though I was very lonely. And the billions it would take to build a direct route from Indianapolis would save almost no time. South Bend just doesn’t draw enough traffic (aside from those fall Saturdays) to justify those billions. Two years after it opened, traffic is down 50 percent on Louisville's new $1.3 billion highway bridge. Like the city-shredding monstrosities of the 20th Century, Shreveport's highway plan would slice through a black neighborhood.